I write about spiral galaxies here, and when I do it’s usually because they’re unusual. They’re really big, or small, or violent, or forming lots of stars. Breathtaking, isn’t it? Click it to galactinate, or grab the super-dooper 3400 x 3000 pixel high-res version. 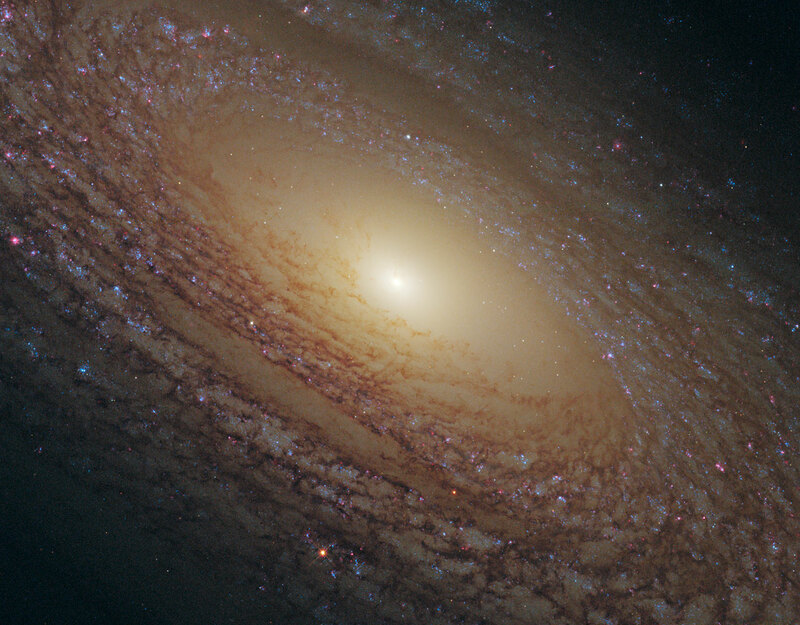 NGC 2841 is about 45 million light years way. That kinda sorta close, but not too far, keeping with our theme of averageness. It’s not particularly extraordinary in any way — assuming that any time you see an object tens of thousands of light years across and possessing a hundred billion stars, you’re seeing something ordinary. This type of galaxy is called flocculent: with lots of short arms instead of a two or three long, grand, majestic ones. It’s forming stars, but not many. Those blue patches are where stars are being born, and they seem small, well-behaved, and scattered evenly across the galaxy’s disk. Everything about this galaxy is, well, polite. It doesn’t have enormous star-birth factories, it isn’t colliding with another galaxy, it doesn’t have weirdly-shaped arms. In fact, I was so suspicious of its normalcy that I did some searching, and honestly didn’t see too many papers about it. This smaller image is from Spitzer Space Telescope, and shows the galaxy in infrared (again, click to embiggen). That highlights dust and star formation, and while again it’s very pretty, there’s not much going on. The galaxy is definitely forming stars; you can see the clumps of dust glowing in the IR. But no big patches, no giant glowing regions. The inner part in the visible Hubble image appears smooth and a little boring, and the same is true in the IR. There’s a nice nucleus, but it’s small and not terribly bright. There’s a supermassive black hole there, as there is in every galaxy, but it doesn’t appear to be actively feeding right now. It’s a LINER — low ionization nuclear emission-line region — meaning atoms near the center are being excited by the action near the core, but not a lot. Some galaxies pump out huge amounts of radiation from their centers, and others are quiet (like the Milky Way). This one is somewhere in between. So if this galaxy is so steady and serene, why observe it? Well, for exactly that reason. If you want to study why galaxies undergo bursts of star formation, you have to understand galaxies that aren’t. You can think of them as a control group if you’d like. Something against which to compare the more gregarious galaxies. Still, its beauty cannot be denied. The Hubble image is really something. The gently clumpy pattern to the arms reminds me of low clouds over the Great Plains of the US, seen from an airplane (something I’ve witnessed countless times). It’s relaxing. Gentle, lovely. It goes to show you: in astronomy, even a run-of-the-mill, average, and not-so-special galaxy is still an object of great and exquisite elegance.